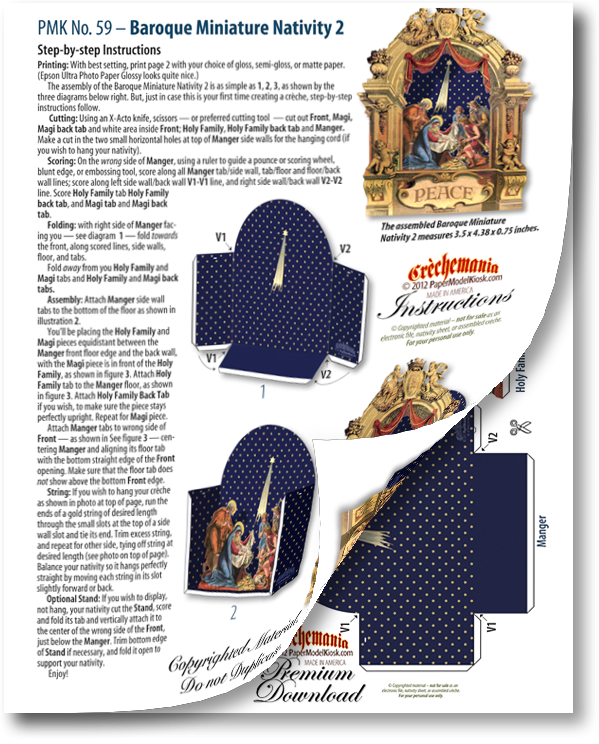 The Baroque Miniature Nativity 2 comes with a PDF (shown at top, above) with step-by-step instructions. The Baroque Miniature Nativity 2 sheet assembles into a luminous crèche. Its proscenium is a mirror-image of No. 1, creating an interesting variation — and inviting a double take; the Nativity scene depicts theAdoration of the Shepherds; and the timeless message of Christmas, "Peace," has replaced "Gloria" in the scroll. But the Star of Bethlehem still blazesamidst a myriad stars that fill the midnight blue sky of the manger. The Shepherds adore at right, and, at left, a seated Mary holds the Child while Joseph looks on. But its the front of the Baroque Miniature Nativity 1 that makes this such a delightful crèche: an arched proscenium elaborately decorated with angels and flora. And should you decide to display — not hang — this lovely miniature nativity, you can do so by attaching an optional stand. A quality-printed 8.5 x 11 sheet and a PDF file that includes complete, step-by-step, simple instructions. 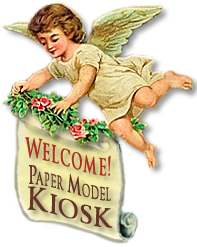 Buy Baroque Miniature Nativity 2 Sheet as part of a collection, and save!